A considerable amount of scientific evidence has been collected leading to the conclusion that urban wastewater components should be designed as one integrated system, in order to protect the receiving waters cost-effectively. Moreover, there is a need to optimize the design and operation of the sewerage network and wastewater treatment plant (WwTP) considering the dynamic interactions between them and the receiving waters. 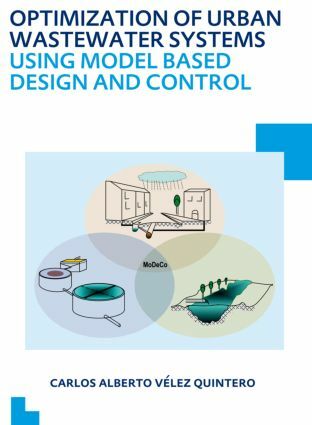 This book introduces a method called Model Based Design and Control (MoDeCo) for the optimum design and control of urban wastewater components. The book presents a detailed description of the integration of modelling tools for the sewer, the wastewater treatment plants and the rivers. The complex modelling structure used for the integrated model challenge previous applications of integrated modelling approaches presented in scientific literature. The combination of modelling tools and multi-objective evolutionary algorithms demonstrated in this book represent an excellent tool for designers and managers of urban wastewater infrastructure. This book also presents two alternatives to solve the computing demand of the optimization of integrated systems in practical applications: the use of surrogate modelling tools and the use of cloud computer infrastructure for parallel computing. Carlos Vélez is a sanitary engineer expert in mathematical modelling of water systems. He has more than 12 years of practical experience in using modelling tools to find solutions for the sustainable management of water systems. Carlos is a former researcher at the institute Cinara and was part of the team that received the Colombian National Award Lorenzo Codazzi for the project: Modelling the Cauca River. He graduated, with distinction, from the Master of Science of Hydroinformatics from UNESCO-IHE Institute for Water Education and has a PhD from UNESCO-IHE and TU Delft, The Netherlands. He has written over 20 publications and participated in the major conferences in urban wastewater and hydroinfomatics. He recently published a book on water quality and ecosystem modelling. Currently he is working in the development of web service application in the cloud, using cloud computing infrastructure to integrate data from urban water systems and information generated with models to facilitate the decision making process at operational and planning level.